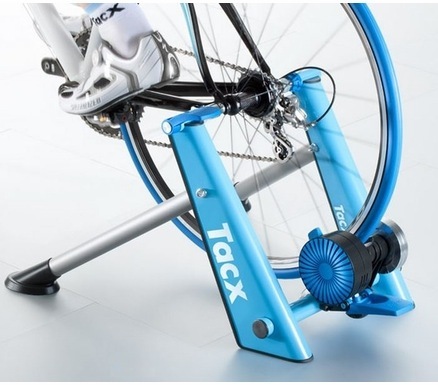 Review Keep yourself in top condition with the Blue Twist indoor cycle trainer from Tacx. The Blue Twist is the entry-level model of the Tacx Cycle Trainer series and uses a magnetic resistance unit to drive all the excitement. The powerful magnetic resistance unit provides a true cycling experience, even at low speeds. The magnetic unit has a maximum resistance of 700 Watts and seven (7) different settings that are manually selected using the resistance lever on the brake unit. It's perfect for straight-forward training sessions, warm ups or cool downs. Be ready for the big race with the Tacx Blue Twist Cycle Trainer. Stay in top condition and train like pro this season with the Booster from Tacx. The Booster is the top model of the Tacx cycletrainer series and uses a magnetic resistance unit to drive all the excitement. The powerful magnetic resistance unit provides a realistic cycling experience, even at low speeds. The magnetic unit, with a maximum resistance of 1050 Watts, has 10 different settings that are manually selected using the handlebar resistance lever. Simple straight-forward training sessions, warm up or cool down - you can do it all. Keep yourself prepped and ready for the next big race with the Tacx Booster Cycle Trainer. Best Tacx Smart Bike Trainers. The Bushido Smart is an interactive indoor cycle trainer with Tacx most powerful resistance unit driving all the excitement. 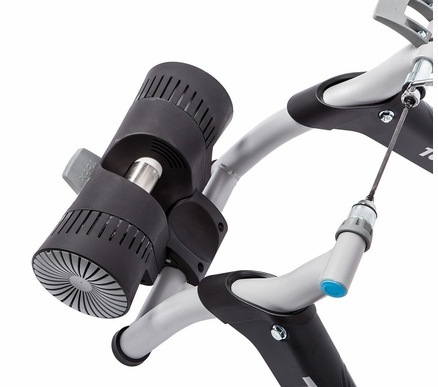 The electric motor brake is the most advanced resistance unit, providing the most realistic cycling experience. The motor brake, with a maximum resistance of 1400 Watts, ensures smooth pedaling, even during steep climbs. This extremely user-friendly cycle trainer easily connects to the complementary Tacx Cycling app via your Apple or Android device. The Bushido trainer uses ANT+ and Bluetooth Smart wireless technology to communicate with the connected device. With the Tacx Cycling app you can ride classic cycling races and legendary stages, or create your own training programs. The Bushido powers itself - it's completely wireless- and doesn't even need a power cable. So don't waste another day sitting around indoors.